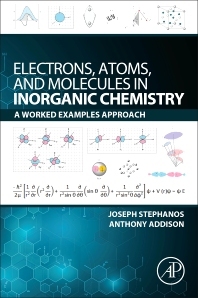 Electrons, Atoms, and Molecules in Inorganic Chemistry: A Worked Examples Approach builds from fundamental units into molecules, to provide the reader with a full understanding of inorganic chemistry concepts through worked examples and full color illustrations. The book uniquely discusses failures as well as research success stories. Worked problems include a variety of types of chemical and physical data, illustrating the interdependence of issues. This text contains a bibliography providing access to important review articles and papers of relevance, as well as summaries of leading articles and reviews at the end of each chapter so interested readers can readily consult the original literature. Suitable as a professional reference for researchers in a variety of fields, as well as course use and self-study. The book offers valuable information to fill an important gap in the field. Joseph J. Stephanos is associate professor of inorganic, bioinorganic, biophysics chemistry at Menoufia University. He has been postdoctoral research associate at Pennsylvania University, postdoctoral instructor and adjunct associate professor at Drexel University and has held various teaching positions leading to the current one. Dr. Stephanos’ research interests concern inorganic studies of biologically active molecules, studying model compounds, their structure and bonding, and the chemistry of metalloproteins and ligands binding, with special reference to mechanistic aspects and structure/function relation. He is the author and coauthor of several articles and one previous book, Chemistry of Metalloproteins: Problems and Solutions in Bioinorganic Chemistry. Anthony W. Addison is a C. & M. Lindback Distinguished Teaching Awardee, a Fellow of the Royal Society of Chemistry (’08) and of the American Chemical Society (’12). He is an officer and past Chairman of the ACS Philadelphia Section, and a member of IES & CSC. He is lead author of the 6th-most-cited article in the field of Inorganic Chemistry in the last 30 years. His >240 articles and conference presentations have garnered ca. 10,000 citations in the research literature. His research interests are focused on the design and synthesis of novel biomimetic and oligonuclear chelates of copper, nickel, iron and vanadium.